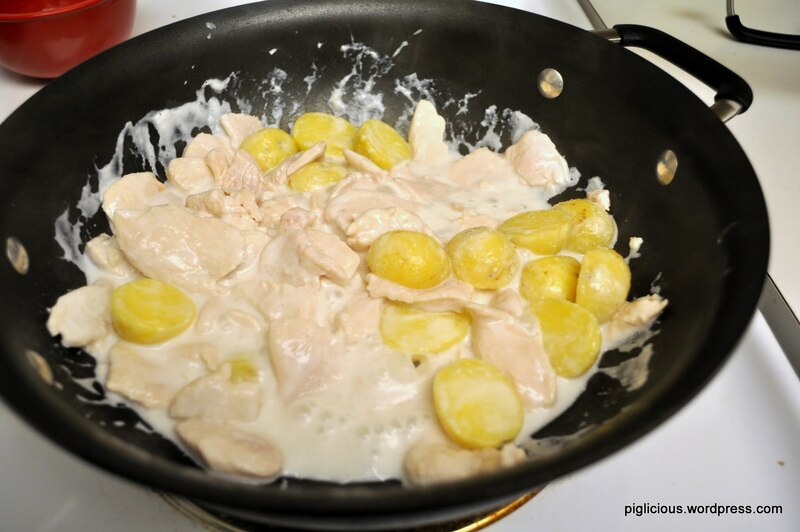 It’s indeed a very simple dish–I’ve made it twice already, first time with potatoes and the second time without. The dish with potatoes seemed to have been thicker (starchier/heavier because of the potatoes I’m guessing) and the dish without the potatoes was the opposite, thinner and less heavy. (optional potatoes) Boil the whole potatoes for about 8 minutes. Drain the water and let the potatoes sit to cool down for about 10 mins. Slice each potatoe in half and remove the potato skins. 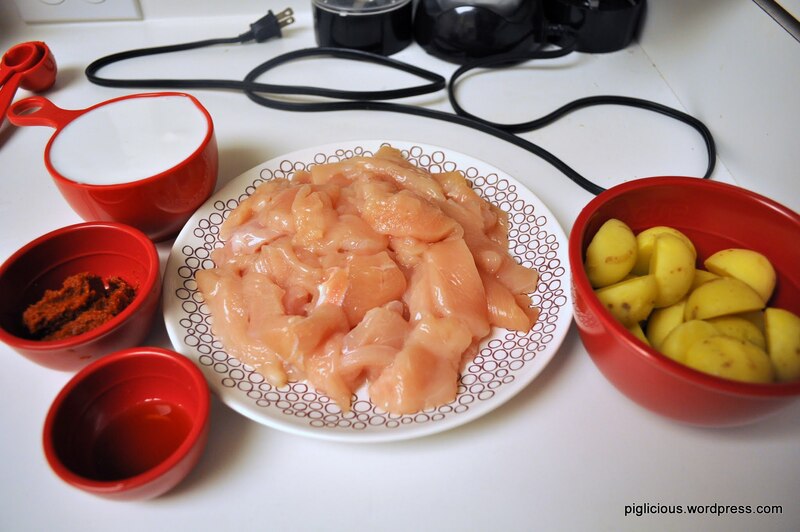 Slice the chicken fillet into thin slices, medium pieces. Turn the temperature to high. When the pan starts heating up, place the oil in. When the oil heats up, place the sliced chicken in. Stir around and let the chicken cook for about 1 min. Add half (or a little more than half) of the coconut milk. 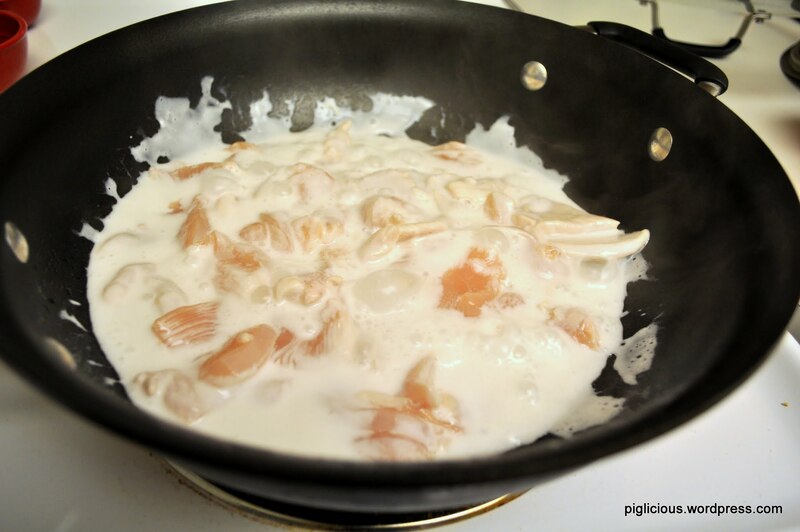 Wait for the coconut milk to heat up and then stir for 1-2 mins. (optional) Add the potatoes in. Stir. 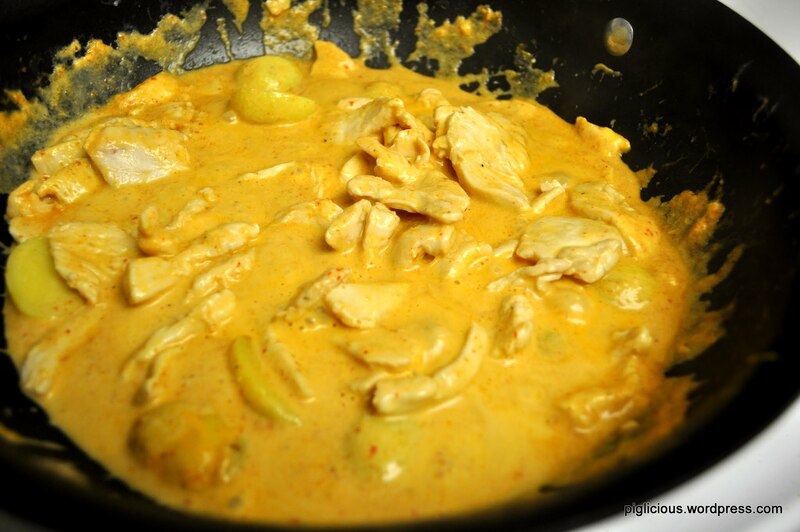 Add the curry paste and stir/mix it in. Add the fish sauce. Turn the temperature down to medium high. Stir and cook for about 4 mins. The sauce should become a little thicker. Add the rest of the coconut milk in. This is to thin the sauce out. Stir and cook for about another 2 mins. 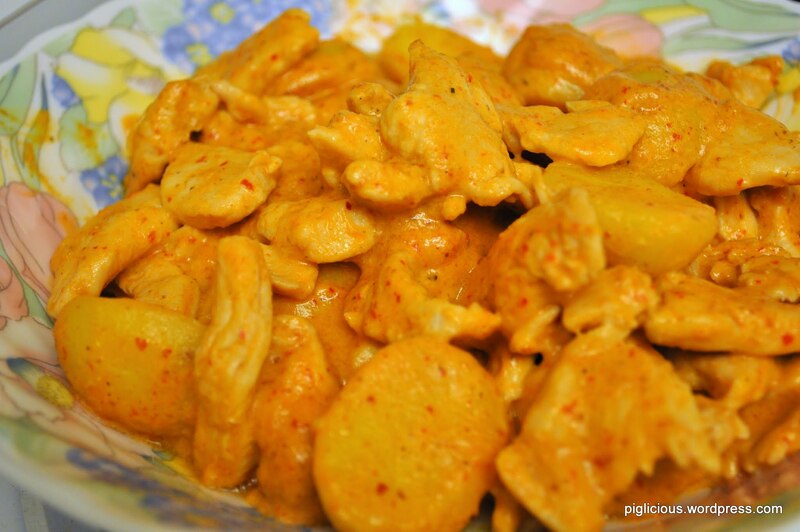 and there you have it, Thai Curry Chicken (w/potatoes)! yum! if you cut out the potatoes, this dish will be a lot faster to make. What is the shelf life on the curry paste once it’s open? And how do I store it? Thanks! 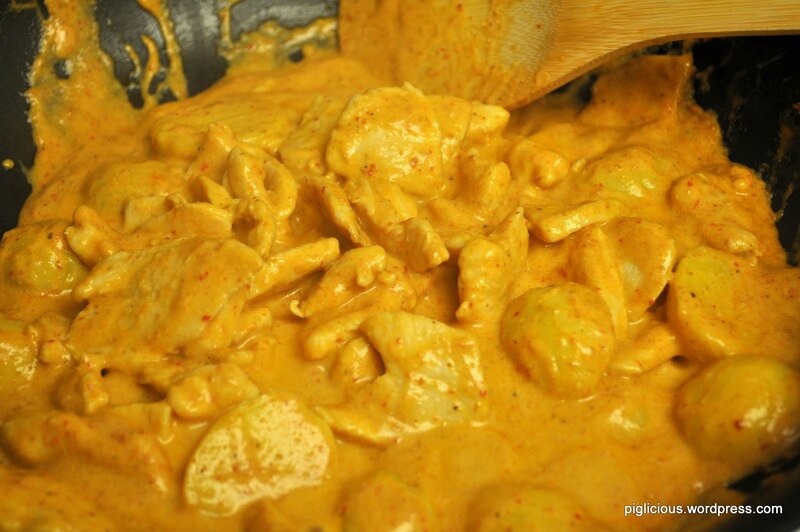 My curry is on the stove as I’m writting this note. It smells amazing! I didn’t have the red curry paste in my pantry but found a recipe to make it on Pinterest and followed it to use in this recipe. Not only did I use the potatoes, but I also added fresh carrot cut thinly on the diagonal and once the sauce was finished I added 1lb shrimp, peeled, deveined and no tails just on top, turned off the heat and put a lid on it until ready to serve. It smells sooooo good I can’t wait to have it with jasmine rice. Thx so much for the recipe!! I’m sure I’ll be using it regularly. You’re very welcome, JoAnn! 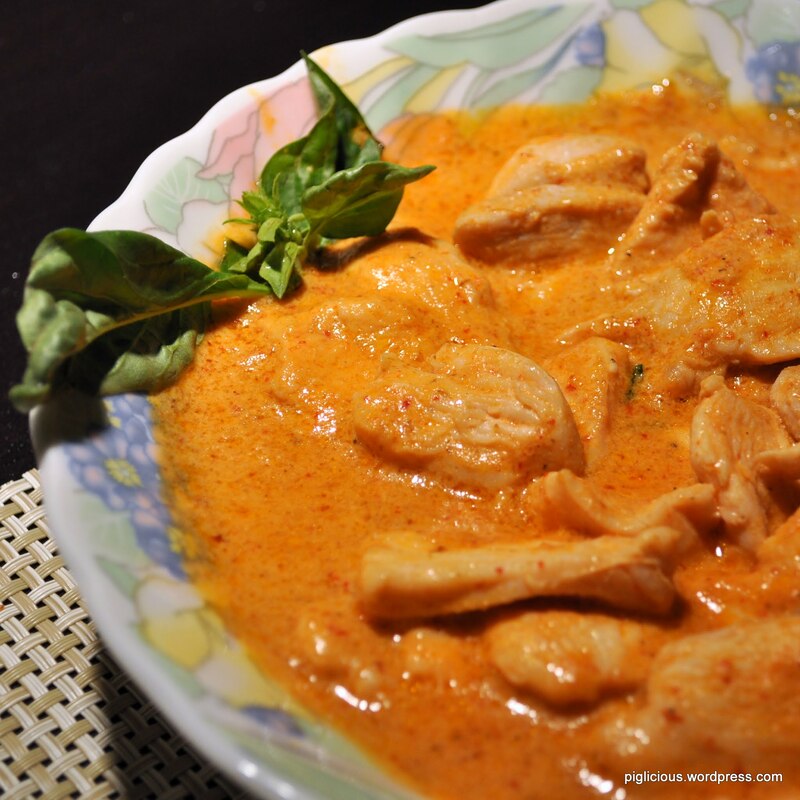 That’s amazing that you made your own red curry paste, and I’m glad this recipe has been helpful to you! Thanks for the tip, Paula! Will give this a try sometime. I don’t have fish sauce. Will it be ok without? 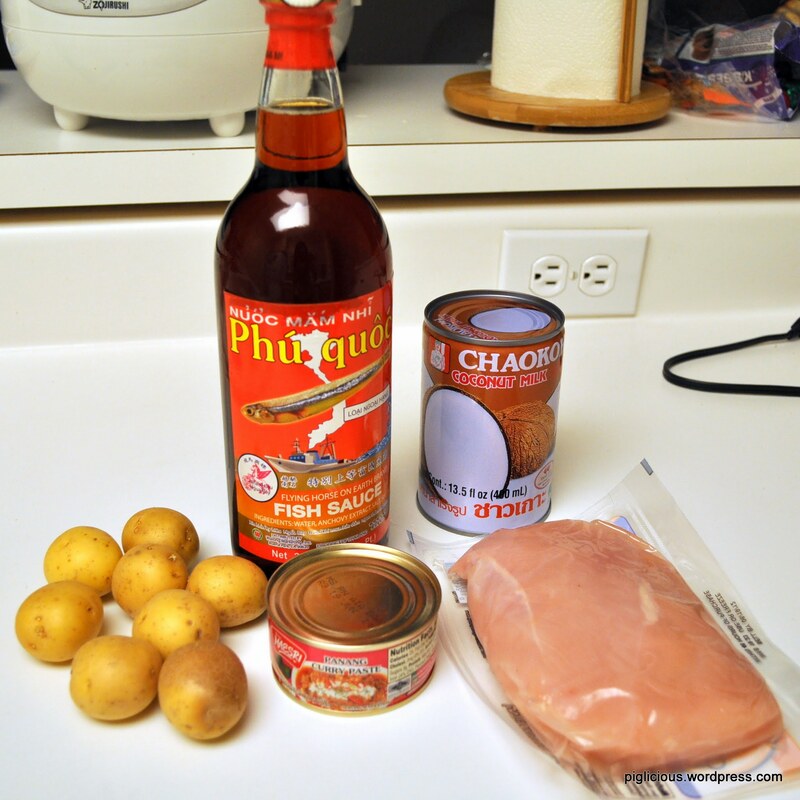 I’ve never tried making it without fish sauce, but it might be okay! You can try and use salt as the alternative.